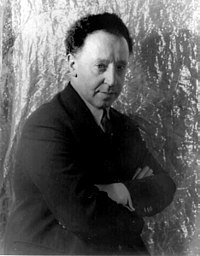 Arthur Rubinstein (January 28, 1887 – December 20, 1982) was a Polish-American pianist. He got praise from around the world for his playing of the music of a selection of composers (many call him the greatest Chopin player of the century). Rubinstein was born in Łódź, Poland to a family of Jews. He was the youngest child of the family. His father was a rich owner of a factory. Although his given name is Artur Rubinstein, in English-speaking countries he wanted to be known as Arthur Rubinstein. However, his United States impresario Sol Hurok wanted him to still be billed as Artur, and his recordings were released in the West under both names. Rubinstein learned the piano at the age of two in Warsaw, before beginning study in Berlin at the age of eight. His debut in Berlin was made in 1898 followed by a debut at Carnegie Hall in the United States in 1906. Throughout his life, Rubinstein was famous as a solo pianist, a soloist in piano concertos, and even as a chamber musician. He retired from the stage at age eighty-nine, and died in Geneva, Switzerland, on 20 December 1982, at the age of ninety-five, and his body was cremated. On the first anniversary of his death, his ashes was buried in Jerusalem – as specified in his will – in a plot now nicknamed the "Rubinstein Forest" overlooking the Jerusalem Forest. ↑ Arthur Rubinstein dies in Geneva at 95. New York Times. Retrieved 2011-11-6. ↑ Rubinstein, Arthur (1973). My Young Years. New York: Knopf. ISBN 0394468902, page 4 - footnote: In later years, my manager Sol Hurok used the h-less "Artur" for my publicity, but I sign "Arthur" in countries where it is common practice, "Arturo" in Spain and Italy, and "Artur" in the Slav countries. ↑ Rubinstein, Arthur. eNotes. Retrieved 2011-11-6. ↑ "Arthur Rubinstein remains are buried in Jerusalem Plot". The New York Times. Associated Press. 22 December 1983. Retrieved 27 August 2007.